Visitors of this hotel will experience unparalleled luxury at this beautiful boutique hotel. Exquisite rooms feature furniture and objects curated by internationally renowned designers. Most rooms feature either private plunge pools or private Jacuzzis. Every room features complimentary Wi-Fi and usage of an in-room iPad. Peerless service and hospitality round out the experience for an unforgettable vacation. Mykonos' many attractions, including fantastic restaurants, elegant bars and nightclubs, stores and boutique fashion houses are all just moments away. 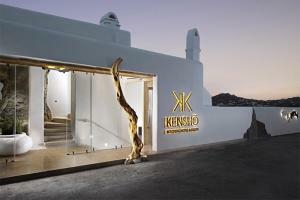 Located on the bay of Ornos, just 2 km away from the town of Mykonos and near Psarou Beach.